I am thrilled that Misty Keith is becoming quite the regular around My Messy Desk! Show her some love as she tackles another tough word in this week’s edition of WORD Nerd Wednesday! In the Old Testament and pronounced in Hebrew, mercy is chanan (khä·nan’). It is also pronounced the same in Aramaic. Please note that there are four other forms of the word mercy found in the Old Testament, however chanan just happens to be the most commonly used. 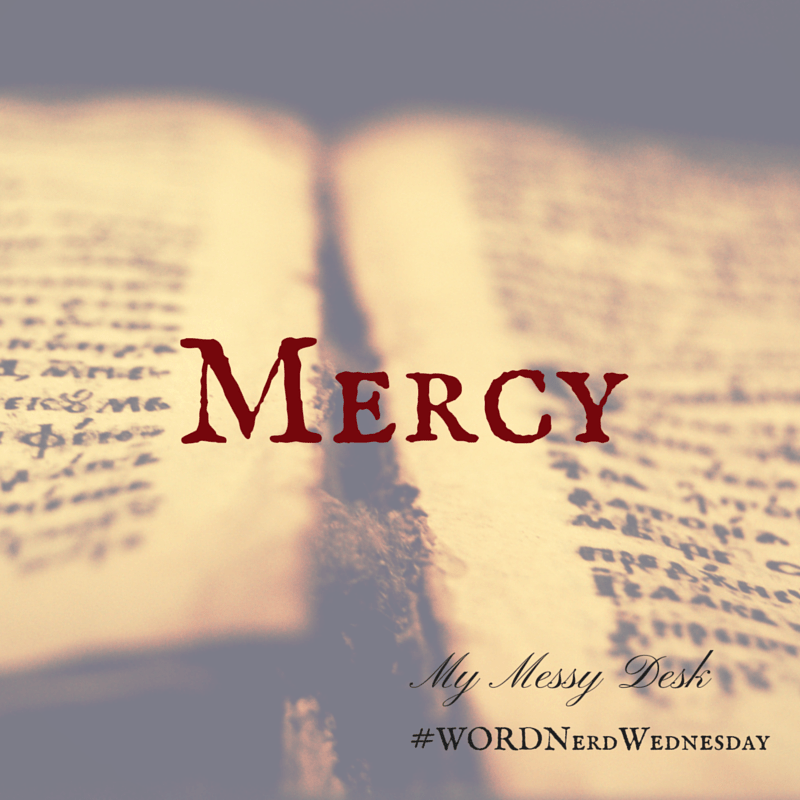 In the New Testament, we find the word mercy pronounced in Greek and it is eleeō (e-le-e’-ō). Please also further note that there are six other forms of the word mercy found and used throughout the New Testament, however eleeo is the most common. Mercy defined – The world’s definition of mercy differs slightly from the believer’s definition of mercy. Mercy from a worldview perspective is defined as compassion or forgiveness shown toward someone whom it is within one’s power to punish or harm. God’s definition of mercy as seen in the Holy Scriptures is defined as compassion and forgiveness shown towards someone who does not deserve it one bit, yet receives it. In both definitions it is completely within the bestower’s power to punish or harm and rightfully so, however, the mercy that comes from God is good, pure, righteous and perfect. The first bestower from the worldly perspective uses clouded judgement, imperfect ways and does not always hand down mercy perfectly like God does and can or like He did to Paul at his conversion. The mercy of God is a major theme throughout the Scriptures. We know that God showed mercy to Israel time and time again. When I think of the word mercy, one person stands out to me as one of the greatest examples of all time. The Apostle Paul called himself the chief amongst all sinners. It has been said that Paul was present at the crucifixion of Jesus. All anyone has to do is read the countless stories of who Saul was before He was converted on the road to Damascus and became the Apostle Paul. After Paul experienced the mercy of Jesus, there was no stopping him. He set out to win souls to Christ and to show others the same mercy he was afforded. It has been said that mercy is not getting what we do deserve which is judgement, condemnation, hell, punishment and getting what we don’t deserve, that is getting to go to heaven and spend eternity with Jesus. Every breath we breathe is at the mercy of God. Apart from Him, we can do nothing. It is also by God’s mercy that we are called, equipped and able to do what He calls us to do and be who He has called us to be. The scriptures are filled with the word mercy. We see mercy over 171 times in the Bible and know that mercy is the basis of all hope. Luke 1:77-78 says “To give knowledge of salvation unto His people by the remission of their sins, through the tender mercy of our God; whereby the dayspring from on high hath visited us from heaven.” Without the new and fresh mercy of God, we are doomed and have no hope. Finally, we must not forget that God shows mercy to those He wants to, when He wants to and how He wants to. That makes Him God. With that being said, He does not desire that any of us perish and therefore lavishes us with all the mercy we need to come into a loving relationship with His Son Jesus. Hello, my name is Misty Ann. I am a daughter of the King of all Kings, wife to Richard, Mommy to Reagan (11 years), Kylee (8 years), and Karis Delaney (6 years). I am a teacher by trade, an encourager and up-lifter by calling and a writer by practice. I enjoy being a friend to those who will have me. I understood from early adulthood and beyond that I would never fit. The Lord helped me to realize that He called me to stand out and because of this, I am forever grateful and at peace with how He has made me and who He has made me to be. Just A Little More About Me…..
My family and I live just outside the Austin, Texas area. I homeschool all three of my children and teach Reading for a private college in the Master’s/Credentialing program. I stay busy and enjoy the hobbies of Reading, Writing, Scrap-booking, Bible-Journaling and Running. As a family, we attend Hill Country Bible Church. We enjoy traveling and take “family fieldtrips” often. All of life is an adventure and we are thankful for every life lesson that the Lord teaches us in the process. I would love for you to join me on Facebook, Twitter, Instagram, Pinterest, or goodreads. For more encouragement please join the discussions on these fabulous blog link ups – Suzanne Eller, Thought Provoking Thursday, Susan B. Mead, Faith Filled Friday, Grace and Truth, Faith and Fellowship Friday, Grace and Truth Friday, Still Saturday, Good Morning Monday, Soul Survival, Monday Musings, Rah Rah Link Up, Tell His Story, Woman to Woman Wednesday, Women With Intention Wednesday, Sitting Among Friends, Word of God Speak. When I think of the word ‘Mercy’ I immediately feel peace wash over me. Such a powerful word because we have such a powerful God who is gracious and loving and merciful. Thank you for sharing your words with us today. Blessings.